ONLINE VERSION – The Digital Marketing Institute Specialist Diploma in Digital Marketing – Acquire a globally recognised professional qualification in digital marketing. This specialized professional diploma course is delivered by some of the industry’s leading search marketing experts. Detailed and structured modules teach you the elements of search campaign planning, creation and measurement, along with an accredited certification to validate your new expertise. How much does it cost? ONLY £1249 + VAT (MASSIVE – Normally £1949 + VAT – This offer won’t ever be repeated) and all course materials & course support are included. PLEASE NOTE: If you choose monthly installments you cannot sit the exam until your fees are paid in full. Our terms state that you will be liable for all payments upon enrolling on the course and if you don’t keep up your payments we will pass the account to our debt collection agency so please ensure you have the means to cover the monthly installments. All students have 6 months to complete the course. WHAT IS THE SPECIALIST DIPLOMA IN SEARCH MARKETING? Transform your career and significantly increase lead generation with our Professional Diploma in Search Marketing. In just 30 hours, you’ll be an accredited Search Marketing specialist with the expertise to create, manage and implement advanced search marketing strategies using AdWords, PPC, display and remarketing techniques. You’ll understand the significance of key campaign metrics, perform analysis and optimization of campaigns to increase conversions, and generate insightful reports to satisfy boardroom level stakeholders in your search marketing campaigns. Future-proof your employ-ability and gain the latest and most up-to-date digital marketing skills needed to thrive in today’s digital economy. The Specialist Diploma in Search Marketing is ideal for candidates seeking to gain a fundamental understanding of the digital skills needed to formulate, run and measure effective search marketing campaigns. It’s best suited for marketing and sales professionals, business owners and individuals who would like to embark on a new, exciting and in-demand career. Upon successful completion of a 3-hour Pearson VUE computer-based examination you will be awarded one of the world’s most widely recognised digital marketing certification. You’ll also gain an internationally recognised badge to display proudly on your LinkedIn profile. 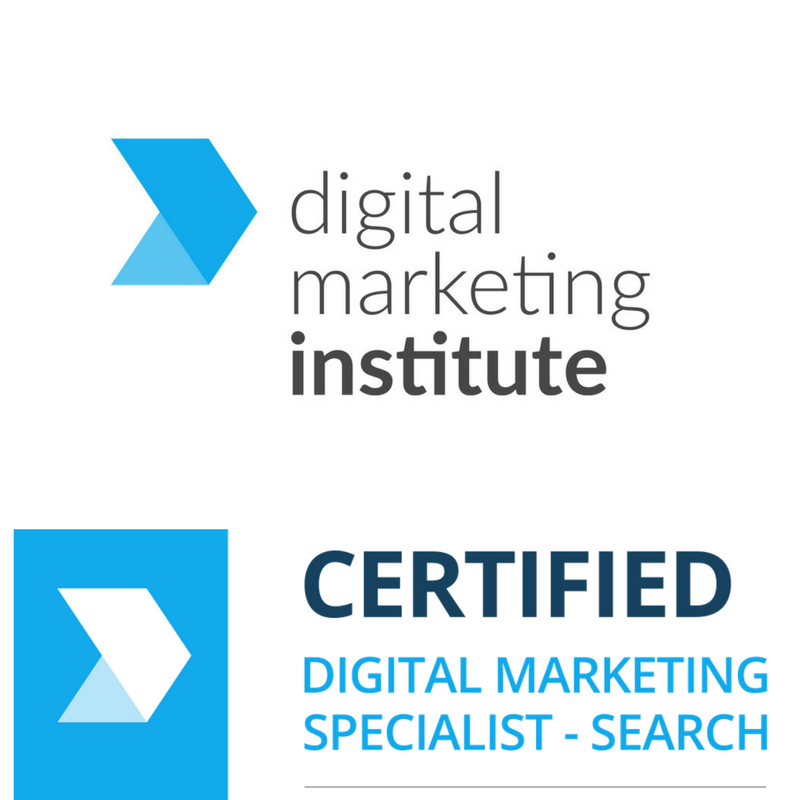 Certified Digital Marketing Specialist in Search Marketing Search marketing is one of the most important digital disciplines as over 90% of web users rely on search engines to find what they are looking for. As such, knowledge of how to increase visibility of a brand and convert relevant traffic from within search engines is crucial to nearly every business operating in the modern marketplace. Designed by the Digital Marketing Institute, this industry aligned certification will equip professionals with the skills and knowledge needed to become a search marketing specialist. Learn how to plan, execute and measure an effective search marketing strategy to help any business rank higher in search engine results and get found faster by quality prospects. This professional certification is ideally suited to professionals who are responsible for the planning, implementation and measurement of search marketing campaigns such as search marketing specialists, search advertising and optimization professionals. Similarly it is recommended to anyone looking to pursue a career or enhance their knowledge in the search marketing discipline. What will I achieve? Upon successful completion of a 3-hour Pearson VUE computer-based examination you will be awarded a globally recognised professional certification in search marketing. Certified professionals will become specialists by learning the latest methods, techniques and tools for improving an organization’s search marketing and brand building efforts. As well as producing innovative and creative search strategies, you will also learn how to leverage these strategies to gain competitive advantage for both your business and career. PPC Advertising – Search The PPC search advertising module details the foundational concepts of Pay-Per-Click advertising.You will learn how to set up a Google AdWords account, interact with the AdWords interface and understand the AdWords hierarchy. You will gain the skills and know-how needed to launch ads and determine which are best performing in terms of conversions and traffic. 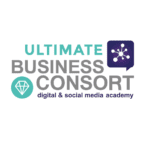 Business Consort – The Social Media Academy is a Digital Marketing Institute Accredited Study Centre – You will receive a certificate after course completion. Learn at a time that suits you with our ‘Online & learning ‘ option! The Professional Diploma in Digital Marketing Online option provides the convenience of online learning but without dedicated times of study – All you need is access to a computer – All of your learning resources will be available on demand 24/7! Watch Video Lectures on Mobile Devices – Anywhere & Anytime! What help & support will I get? You have access to ask questions direct to your tutor through the on demand learning community as well as the ability to connect and network with other learners. We offer monthly tutor calls to guide you through getting started, to designing a study plan to suit each student and coaching you through each step of the course from enrolling to sitting your exam. In addition, you will also be able to reach your student services be phone from 9am – 5pm Mon to Fri (GMT) on 0800 334 5784 and contact via email too. How long will it take to qualify? There are 10 modules which is about 30 hours of video style lectures. You will need to do some research, complete some practical activities, do some reading around the topics covered in the syllabus to ensure you get as much from the course as possible. Most students are ready to take their exam within 3-4 months. You must take your exam within 6 months or enrolling. Are there any exams & how will I be assessed? Yes there is an exam which is 180 minutes (3 hours) – There will be a range of question formats such as Multiple Choice, Image based Selections, Matching & Hot Spot Questions. When will I take my exam? Candidates must take the exam within 24 weeks of completing the specialist Diploma. We recommend students take the first exam 3-6 weeks after the completion of the course. If you do not book your exam well in advance of your exam eligibility end date there is a chance the test centre will not have any available dates left. The Digital Marketing Institute do not offer Exam Eligibility Extensions. Should a candidate fail their first exam attempt, they must repeat the exam within the exam eligibility period. Candidates have three exam attempts in total. It is the candidate’s responsibility to ensure they book their exam and take any further repeat exams within their 24 week eligibility period. The dynamic qualification will provide you with knowledge underpinning the principles of search marketing and skills to enhance online visibility. 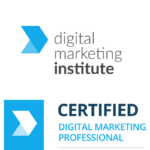 About The Digital Marketing Institute – The Digital Marketing Institute is the global certification standard for digital marketing, certifying digital professionals in over 60 countries and 5 continents across the globe. Learn from world-class digital marketing lectures and study up-to-date course content created by working industry experts. Each course syllabus is validated by the Digital Marketing Institute’s esteemed Syllabus Advisory Council made up of representatives from leading digital giants, including Google, Twitter, Facebook, Microsoft and Ebay. Digital Marketing Institute courses are designed and refreshed to equip you with the latest and most in-demand digital marketing skills needed to land your next role in today’s digital driven economy. Students gain an internationally and industry-recognised digital marketing qualification upon completion and passing of a Pearson VUE exam, perfect for displaying on your CV or LinkedIn profile. Your online learning will be hosted by a variety of industry professionals but your dedicated tutor (Dawn McGruer) will also deliver some of these sessions and will be your coach & mentor throughout. Dawn is a strategic digital & social media marketing trainer, practitioner, consultant, author and blogger who has over 15 years experience in the digital marketing arena. She is also the Director of Business Consort which was established in 2005 and has developed it into one of the world leading training organisations which is accredited by The Chartered Institute of Marketing. With over 4 million subscribers Dawn has become a key influencer in this area and provides Social Media and Digital Marketing Training Courses including the CAM Diploma in Digital Marketing. Dawn is also a Fellow of the RSA – The Royal Society for the encouragement of Arts, Manufactures & Commerce founded in 1754 – She was invited as recognition of her expertise in the field of social media marketing and her work to raise awareness of the advantages of social media to business owners. Are there any other fees to consider? In order to achieve certification for the qualification you are assessed by 180 minute online exam which costs: £140. This is paid directly to Pearson Vue of which the all details will be included in your welcome email as well as information about registering for your exam. As soon as you enrol you can start the course straight away – We will send you a welcome email and login details for the learning community. You can choose when you wish to register for your exam and it’s totally dependent on how long it takes you to complete the syllabus of learning materials and when you feel ready but you can talk this through on your calls with your tutor to discuss your study plan. 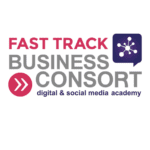 Why choose Business Consort as your Accredited Study Centre? We have addressed the new need of busy individuals who want to further their learning but don’t have time to take out of their schedules to attend day / evening face to face courses. Hence this will be the only diploma worldwide delivered completely online and ours is by far the most cost-effective option versus any other study centre or delivery method. You will have the opportunity to gain skills and knowledge to understand the fundamental planning concepts for an online organisation as well as key factors in implementation, measurement and evaluation of successful campaigns. Digital marketing has evolved from a peripheral element of organisational marketing to one which is at the hub of customer-centric communications in an increasingly multi-channel environment. Our qualification will ensure you are equipped to deal with this shift and make the most of the new business opportunities to offer.